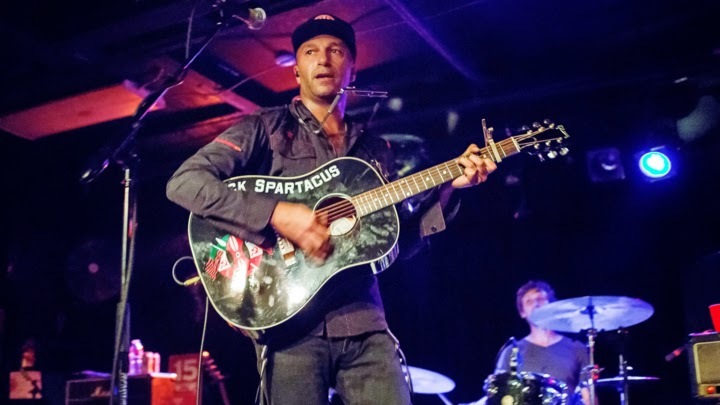 On September 5th at the Jail Guitar Doors benefit concert in Los Angeles, Tom Morello's the Nightwatchman unveiled a bluesy new rocker called "Marching on Ferguson." The track was inspired by the shooting death of Michael Brown and its impact on the city of Ferguson, Missouri. Now, Morello has released the studio version of the track to help support the protesters who were subsequently arrested in the aftermath of the Brown shooting. The track is available as a free download at Ferguson October, a collaborative effort with hundreds of organizations seeking an end to police violence in black communities both in Ferguson and across the country. Morello's rocker is the first in a series of "Artists for Ferguson" campaign that will see musicians creating and donating songs to help support a legal fund for the arrested Ferguson protestors. While the song is available for free, fans are encouraged to leave a voluntary donation in order to assist Ferguson protestors' legal battles. "100% of the profits from 'Marching On Ferguson' will support defending the protestors in the Ferguson area who have faced attacks, wrongful arrest, and violence from the police," Morello says. "I've witnessed countless incidents of racially motivated police brutality in my lifetime and it's time to say 'Enough!' in the name of all those wrongfully killed and abused. For all the courageous men and women raising their voices against injustice in Ferguson, and beyond, give 'em hell. This song is for you."